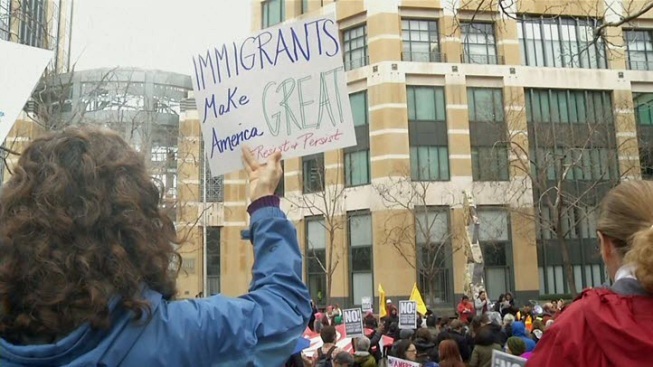 Hundreds of immigrant advocates took to the streets Tuesday after the Department of Homeland Security released sweeping new deportation guidelines. Jodi Hernandez reports. Hundreds of immigrant advocates took to the streets in Alameda County Tuesday after the Department of Homeland Security released sweeping new deportation guidelines. The Department of Homeland Security plans to ramp up deportations, including hiring 10,000 new immigration agents and directing them to arrest any undocumented immigrants they encounter. The new guidelines has sparked more fear and uncertainty in the immigrant community. Local immigration advocates said they will protect undocumented immigrants. Advocates are also calling on the Alameda County Sheriff not to cooperate with U.S. Immigration and Customs Enforcement.